Miriam M. Irwin, 105, passed away Saturday, September 8th, in Abilene. She was born August 23, 1913 in Woodbine, the daughter of C.F. and Lillian (Haller) Moore. Growing up in Woodbine and Abilene, Miriam attended local schools, graduated from Abilene High School and attended two years at Salt City Business College in Hutchinson. She had been employed as a legal secretary for Arthur Hurd. On October 35, 1939 Miriam married Roy Irwin in Abilene. 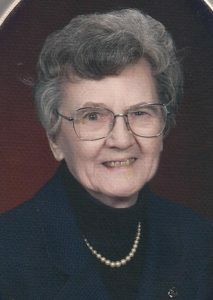 She had been the Assistant County Clerk for Dickinson County from 1960 until retiring in 1975. Roy preceded her in death in 2008. Miriam was a member of the Emmanuel Church and UMW. She enjoyed spending time with family and church friends, cooking and hand work. She was also preceded in death by three sisters, Izella Bowser, Gladys West and Gertrude Moore; a brother, Lester More and great-grandson, Jacob Delimont. Miriam is survived by two daughters, Judy (Larry) Coup of Talmage, Joyce (John) Zey of Topeka and son, Fred (Suzanne) Irwin of Elbert, Colorado; nine grandchildren and 24 great-grandchildren. Funeral services will be held 11:00 AM Wednesday, September12th, at the Life House Church with her grandson, Pastor Kerry Coup, officiating. Interment will follow in the Abilene Cemetery. The family suggests memorial contributions in her name be made to Hospice of Dickinson County or Abilene Place. They may be left at the church the day of the service or left at or sent in care of the Danner Funeral Home POB 758 Abilene, Kansas 6410.